Spring produce doesn’t get much more iconic than the sweet green pea. Whether fresh or frozen, we encourage adding this versatile green vegetable to any family meal, especially pasta with Prosciutto and peas. Tossing up peas and Prosciutto will create the extra pizzazz that hungry mouths are yearning for. The addition of Prosciutto di Parma presents an added bonus, and really works to brighten up and nicely contrast the savory hint of truffles. This colorful and healthy bite may make other dishes green with envy. 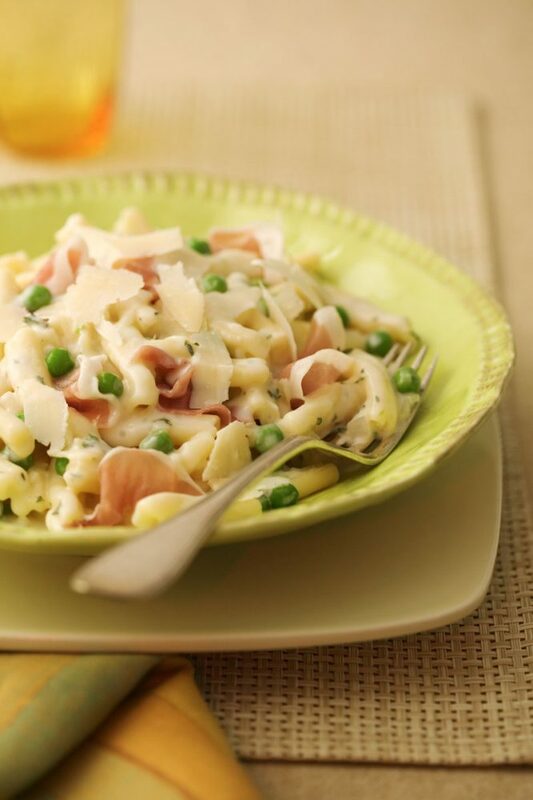 Whether it’s lunch on the go or a fancy meal occasion, pasta with Prosciutto and peas is a perfect dish to usher in spring! In a saucepan over medium heat, melt the butter and olive oil. Add shallots and garlic; gently sauté until lightly browned. Add heavy cream, thyme and bay leaf, simmer until the cream has been reduced by half; remove bay leaf. Season with truffle oil, lemon juice, salt (to taste) and pepper. Set aside. In a sauté pan large enough to hold all of the ingredients, add the Truffle Cream; warm slightly. Add cooked, drained pasta; continue to warm, tossing occasionally. Add Prosciutto di Parma, Parmigiano Reggiano and peas; heat gently. Adjust seasonings if necessary. Portion pasta in bowls. Drizzle each portion with some additional truffle oil; garnish with Prosciutto di Parma strips and Parmigiano Reggiano shavings, if desired.